BITV (Barrierefreie-Informationstechnik-Verordnung) by Claudia: Accessibility requirements in the german public sector and how you can use the BITV-Test to check the accessiblity of your site. If you have a topic for the upcoming meeting – we will find a slot… Your topic could be related to a book, article, prototype, startup-concept, wireframe, your application, …. We are always looking foward to welcoming new people at the Stammtisch! 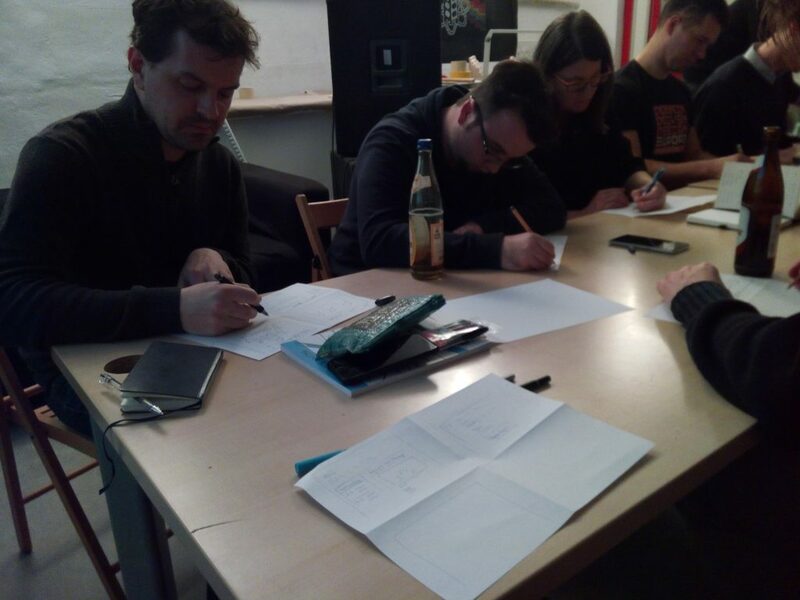 In February 20 UX and Ixd fans decided to spend a very interesting valentines-evening at the Metalab. Jörg – @japhyat – presented the Design Studio method and we tried out the method. Design Studio it’s a workshop technique for collective idea generation (in our case: sketching) that has been used in Architecture for quite some time (to my knowledge). It became popular when the method of Agile Development required to create solutions to a problem much faster. It work’s like this: First you have to set up a workshop and a group (about 7 people seems to be the best number for this). The group should not consist only of designers, but be composed of all kinds of disciplines that are occupied with the problem to be solved (marketing, customer service, IT, …). After an introduction to the method you’ll need to have some kind of material that allows the participants to empathize with the target users. You could use personas for this. Then you’ll have to explain the problem (what do you want to achieve?). After that, a first round of sketching takes place. Each participant creates 4 different and very rough sketches on paper alone during a short limit of time (5min eg). The sketches should of course show a way on how to solve the problem. After this first round, everyone presents his or her sketches and answers to questions from the other participant. This round of critique is also timeboxed (eg. 2 minutes per presentation). After that, a second round of sketching takes place. This time, the participants can either continue with their own ideas or build upon/include the ideas of the other sketchers. In this round, only one sketch per participant is created. The time for this round is also limited (5min eg.). After sketching round 2, another round of critique takes place (same procedure as first round). After critique nr. 2, depending on the size of the group, it’s possible to do group-wise sketching. For example, a group of 3 participant could work on one sketch together. Again, they can use parts of other sketches explained during the critiques. Afterwards you can do one more round of critique and sketching (this time doing one sketch together with the whole group). Again, please remember that how many rounds you can do depends on different factors like group size, time constraints, the width of the problem space (design constraints) and so on. But basically the idea is that you will move from many very different concepts to one big concept that can incorporate many of the ideas that were generated in the group. It’s better suited for design work than brainstorming, for example, in that it works by synthesis and not by exclusion: The participants will build on ideas by others and use them. How to start in a new job as “UX team of one” and survive? 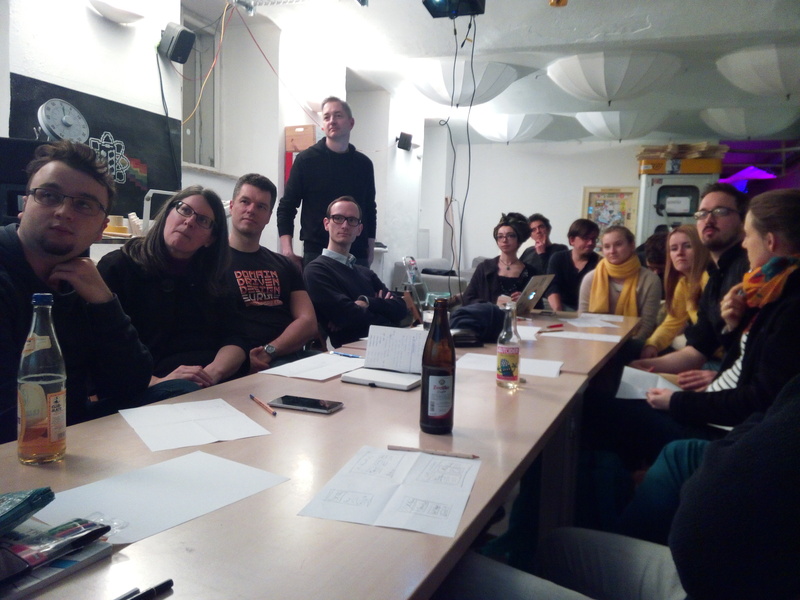 After the Design Studio workshop we started discussions about various topics. One was about how to start in a technical-led company as the first UX engineer – and what should be considered? Make the engineers aware that UX is important. BUT appreciate what they have done because they have thought about the current result already. Jobs are available at Tieto (contact Bernhard) and Uniqua. Interaction Design is … from Interaction Design Association on Vimeo. Join us on Meetup or on our Mailing-List. If you want to join our Slack channel contact me.